Lockaway Storage Stuff the UNIT Event is June 2nd! 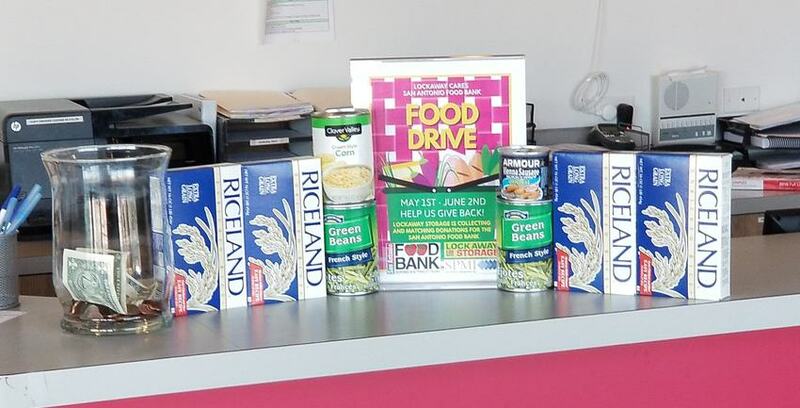 Can you believe we’re almost halfway through this year’s Lockaway Cares Food Drive? With so much support from the community and enthusiasm from each of our facilities, we decided to check with some of the managers and assistant managers to see how much progress they’ve made toward their goal of providing 100,000 meals to the residents of San Antonio, Texas. In addition to this team goal, each facility is also trying to win the distinction of raising the most out of all 30 locations! This is the second year that we have partnered with the San Antonio Food Bank to raise donations. For Tammye, seeing CEO Don Clauson’s passion for the drive has made all the difference in her facility’s performance in the fundraising competition. Anybody who wants to participate! Because Lockaway Storage believes in helping those who could use a hand. Mauricio Contreras, assistant manager at Lockaway Storage on Culebra Road and Lockaway Storage on Huebner Road, said that his locations were doing pretty well with a combination of cash and food donations. Their strategy? Reaching out to local businesses. One business made an anonymous cash donation. Another one filled their office with many packages of food. While Mauricio and his team feel close to victory, they will need to keep a close eye on the numbers as other facilities continue to think of new ways to up their fundraising game. Donations are coming in at Lockaway Storage locations around San Antonio. Corey makes receiving cash donations from customers look easy. Macie Duncan, assistant manager at Lockaway Storage – Shaenfield in San Antonio, said that while they are receiving a pretty good amount of food donations, money donations are more difficult to come by. A dollar donation can provide seven meals, so it’s understandable why facilities are encouraging their communities to make cash donations in addition to individual food items. Of course we love the competitive nature that is helping to reach that goal, so don’t forget that the Stuff the Unit event is happening on June 2nd at Lockaway Storage on Culebra Road! The event is open to the public and all facilities attending will gain extra points for attending and donations made that day! Self Storage Milestone: Happy 1-Year Anniversary to Sandy Heredia!